In the fall of 2003 Troy Gustafson and Bryan Mero had an informal meeting in the café of a Fry's Electronics store. They discussed the creation of a new type of comic book and created a new company called RedMachine Comics. They both observed that the Christian point of view is very rare in the comic book realm. The only mainstream Christian character they note is 'Nightcrawler' from the successful X-Men series from Marvel. "It's a bit of an irony," says Mero, "that Nightcrawler is a demon-like creature yet he's the one to embrace God. We wanted to have a more realistic and mainstream character." The result is a down-and-out character named Sam who finds himself at a final crossroad. "We wanted to put a story together that wasn't cheesy or preachy" says Gustafson, "I gave that portion to Bryan and he provided a great story." Bryan Mero has been a comic book fan since his very first comic book bought at a local drug store back in 1977. Since then he has become an avid collector and fan of Marvel and DC comics. "I probably still have a couple thousand comics up in my attic," says Mero. 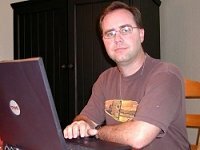 Writing has not been his trade of late, being a computer support supervisor for many years, but he has written many short stories and ventured into screenwriting. "This was the perfect format for me. I'm able to put together an insightful and entertaining story and squeeze it into twenty pages. I've been trying to put myself in Sam's shoes. What would I do if these incredible things started to happen to me?" says Mero. "Angels fight the powers of darkness and we wanted to come up with an enemy that had not been seen before. I came up with the idea of the 'demon seed.' A demon seed is a new breed of demon that is in physical form." Troy Gustafson is an accomplished graphic designer and has been working at a printing company for many years. His love of comic books is rivaled only by Mero which makes a good partnership. "I always knew I would draw a comic book one day, and this seemed like the greatest opportunity," says Gustafson, "Bryan gave me the story and it was my job to come up with the look and feel. I became the penciler, the inker and the colorist all at the same time. It's a big undertaking but bringing this story to life will be worth it." 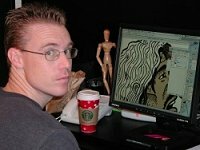 Gustafson's talents go beyond just artistry; he is an expert Mac user and an accomplished flash developer and webmaster. In the aftermath of religious based films such as 'Passion of the Christ' there seems to be a void that needs to be filled. Although not only directed toward church-goers, the story crosses over to the mainstream and brings a fresh story that everyone can relate to. "Our story isn't just about 'God' but also about our human tendencies. We all feel alone sometimes. Some of our biggest challenges in life bring out the best or the worst in people" explains Mero. "Troy's artwork hits the mark and beyond in bringing a realistic and gritty world to life." Issue #1 of Spirit Knight was debuted at WonderCon 2005. Issues #2 and #3 were launched in 2006 and 2007. Spirit Knight issues will be available on-line at www.Spirit-Knight.com and will be distributed to select stores across the country. Red Machine Comics will continue to attend WonderCon in San Francisco for each issue. "We can't wait to go back to WonderCon with more issues to sell," says Mero, "WonderCon is one of the best ways to grab attention!"